La Festa Autunno 2012 was held October 19-22, starting and ending in Tokyo. 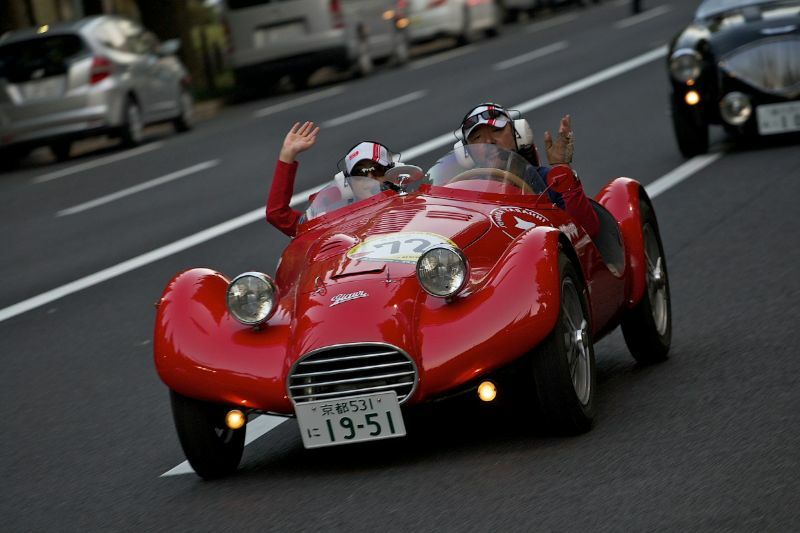 The third weekend of October saw the cream of Japan’s crop of historic rally machinery take to the highways and byways in and around Tokyo for the annual jaunt in honour of the world’s most famous rally, the Mille Miglia. La Festa Autunno as it’s been named since last year, though which previously borrowed its identity from the Italian classic, was once again a resounding success as 93 entries gathered in the capital’s Harajuku district for the start of four days’ driving. Using some of the country’s most well-known roads and traveling through many famous resort towns and hamlets west of Tokyo, the cavalcade of classic cars brought out locals in all of the seven prefectures through which the rally passed. For its 16th running, there was the usual posse of celebrities and personalities on hand, former Formula One drivers Aguri Suzuki and Ukyo Katayama heading the roster from the automotive world. TV and film personalities also dotted the entry, and there were even a couple of all-international crews contesting the 1,200km competitive distance. As usual for this time of year, the weather cooperated fully on all four legs of the event, the 2012 running taking in a Friday – Monday schedule. The opening day’s test, the shortest on the event at just over 200kms, took competitors through Tokyo’s busiest shopping areas before heading north to Karuizawa for the first overnight stop. From there, it was an early start on day two, the longest leg this year at over 378kms, where entrants took in the breathtaking scenery around Yuzawa, Nozawaonsen and Kusatsu on a mountainous route that looped back to their starting point for the day. Day three of La Festa Autunno 2012 headed out of Karuizawa and directly south on a faster, less twisty route than the previous leg, passing through Koumi (namesake of another famous historic rally in Japan) and the village of Narusawa before an afternoon of high-speed driving at Fuji Speedway. The day concluded in picturesque Hakone, still the most famous (and exclusive) of the country’s getaway destinations. After an early morning run on the Izu Skyline, the final leg followed a mostly coastal route back to Tokyo, taking in Odawara Castle before the drive due East, first to Yokohama’s Red Brick Warehouse district and then on to the capital. Adopting the theme “Gambare Nippon” (Go For It, Japan) in support of the tragic events of March, 2011, La Festa Autunno has raised funds for the people in the areas of the country’s Tohoku (northeast) region affected by the natural disasters, a part of the country with deep connections to the event, though which are now off-limits. Charity boxes could be seen on the bonnets of many of the participating vehicles wherever the parade stopped, with admirers of classic machinery giving generously to a cause that has affected everyone all across this country. Entrants themselves came from a staggering array of places up and down the island chain, with license plates from as far away as Hiroshima and Kita-kyushu to the southwest, and as far north as Iwate making up the list. Judging by the outpouring of support for the Gambare Nippon initiative, the plan is working wonderfully. A long-term resident of Tokyo, Len Clarke has been promoting motorsport – specifically Japanese motorsport – for the past ten years. An expert on what is a highly-organized and mature sector in Japan, Len reports to publications overseas on the current state of all the international-level series in the country. Clients include some of the top Japanese manufacturers, including NISSAN (NISMO) and SUBARU (STI).